Why RadioShack, Barnes & Noble and other brands you love are going bankrupt. 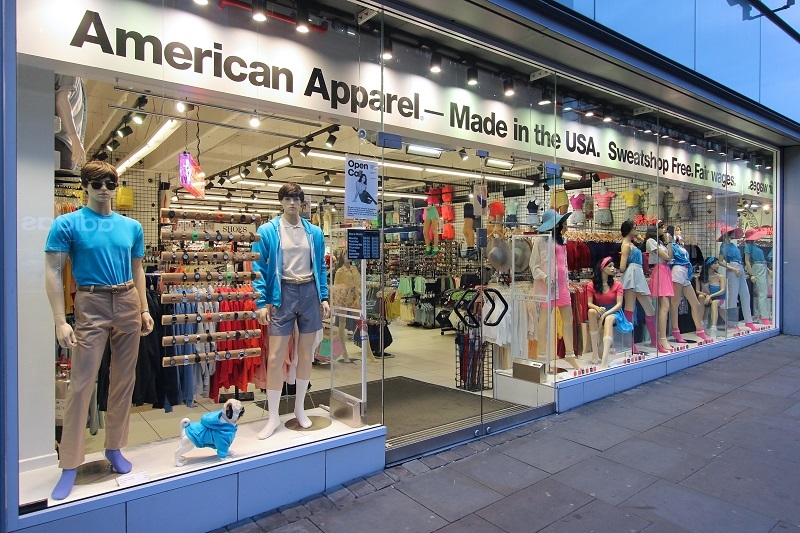 Trendy retailer American Apparel is the latest retailer to file for bankruptcy. Over the past few years, many popular companies have been forced to either completely shut down or close a number of stores — resulting in thousands of lost jobs. Learn about the 10 worst store closings of all time. On Oct. 5, 2015, American Apparel announced it had filed for Chapter 11 bankruptcy. The retailer had been struggling for some time, as it was weighed down by massive debts, a drop in sales, employee conflict and an ongoing legal battle with exiled founder, Dov Charney. The company does not plan to close any of its more than 200 stores. CEO Paula Schneider said the restructuring will help the company become stronger, as it has reached an agreement with 95 percent of its secured lenders to drastically reduce its debt and interest payments. The American Apparel board has approved a plan for lenders to eliminate more than $200 million in bonds in exchange for shares in a newly reorganized company. Participating lenders include Goldman Sachs (GS) and Standard General, among others. RadioShack stock plummeted last December, just months before the electronics giant filed for bankruptcy on Feb. 5, 2015, after 94 years of business. The company tried to keep up with changing technology and consumer habits, but failed to stay afloat. It filed with $1.2 billion in assets and $1.38 billion in liabilities, naming between 50,000 and 100,000 creditors. The retailer shuttered more than 1,740 stores and surrendered the rights to its name to hedge fund Standard General for $26.2 million. The firm plans to operate existing locations under an agreement with Sprint. Wet Seal entered Chapter 11 bankruptcy on Jan. 15, 2015. Prior to the filing, the company closed 300 stores and cut the jobs of nearly 3,700 employees. Versa Capital Management LLC purchased the retailer for $7.5 million in cash to pay unsecured creditors and $10 million in exit financing. The firm also agreed to take on a $20 million bankruptcy financing commitment from B. Riley and pay the company a $625,000 breakup fee. Versa agreed to keep at least 140 Wet Seal stores open. The transaction was completed on Aug. 10, 2015 and Wet Seal board member Melanie B. Cox was named the retailer’s new CEO. In November 2013, Office Depot (ODP) agreed to purchase OfficeMax in a $976 million deal. By February 2015, investor Starboard Value — that owns large stakes in both Office Depot and Staples (SPLS) — was pressuring the companies to merge. On Feb. 4, 2015, Staples announced plans to purchase Office Depot in a $6.3 billion deal. Staples plans to close 225 stores by the end of 2015 and Office Depot plans to close at least 400 by the end of 2016. The world’s largest restaurant chain has been struggling to keep up with new competitors in the U.S., a challenging European economy and a food safety scare in Asia. In 2015, McDonald’s (MCD) announced an 11 percent decrease in revenue and a 30 percent drop in profit for the first three months of the year. Consequently, the fast food chain announced plans to close 700 of its approximately 32,500 restaurants worldwide. Since then, the company has been involved in a number of rebranding initiatives, including serving all-day breakfast and leading an initiative to assist the United Nations’ food program in responding to the Europe and Middle East migrant crisis. On Jan. 20, 2014, women’s clothing retailer Dots filed Chapter 11 bankruptcy and closed its 359 stores, seemingly signaling the demise of the company. However, a Florida firm in the retail industry saved the day by purchasing Dots and helping to correct the problems it previously faced. The new owner, New Dots LLC, paid $326,000 for the Dots logo and other intellectual property. Eight stores reopened by August 2014 and the company hopes to open 120 more Dots stores by the end of 2015. Barnes & Noble (BKS) isn’t bankrupt, but profits have taken a hit, as the bookseller struggles to keep pace with declining book sales and weak demand for its Nook eReader. In 2014, the company announced it would be closing 223 stores through 2023. In 2015, the company hired new CEO Ron Boire to help revive the brand. In 2014, Family Dollar announced it would close 370 underperforming locations, reduce its workforce and cut prices on more than 1,000 items, in an attempt to combat slow sales. The company planned to save $40 million to $45 million with these initiatives. Family Dollar was purchased by Dollar Tree (DLTR) in July 2015, in a deal valued at $9.1 billion. Dollar Tree has agreed to allow existing Family Dollar stores to keep the name and work to expand the names of both brands. Women’s retailer Deb Shops filed chapter 11 bankruptcy on Dec. 4, 2014. The company closed all of its nearly 300 stores, blaming its poor performance on a number of factors, including historic lack of capital, tired stores and a lack of competitiveness in the juniors fashion landscape. In January 2015, Body Central — also operating under the Body Shop brand — announced it would be closing all 265 of its stores and laying off its 2,500 employees. The company opted to shutter the business through a state process instead of a standard federal bankruptcy. A separate filing noted that lender Crystal Financial ended its $17 million credit line, which left the company without a source of revolving debt. Body Central had hoped to reorganize as a smaller chain, but failed to raise the necessary financing. One day after American Apparel announced its bankruptcy filing, the company announced that the New York Stock Exchange would be suspending its stock trading immediately and starting the process of delisting its common stock. The company said it received a notification from the NYSE that it determined the retailer is no longer suitable for listing. The NYSE stated that it “noted the uncertainty as to the timing and the outcome of the bankruptcy process, as well as the ultimate effect of this process on the value of the company’s common stock,” said an American Apparel statement. The retailer said it does not plan to contest the delisting determination. Investing in retail isn't the smartest idea — unless you target the long-time industry champs.